What is that? Why would you draw something like that? What inspired that? All these questions when I proudly expose my creature design. I sit down to draw, I never know what is going to come of it. It’s one of the main reasons I do draw. So let’s answer some of these questions. What is that? Well, my friend, that is a little creature I call Auque. Named from the word aculeus meaning prickle or spine. 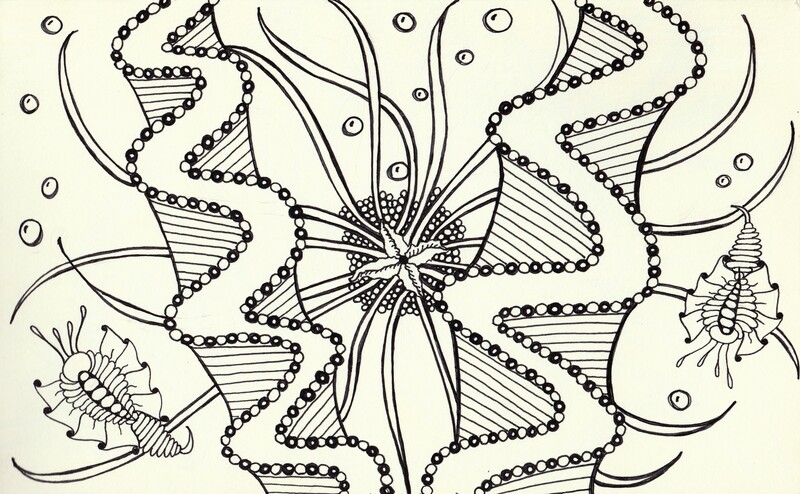 Its design came to me when I started looking through zentangle patterns. Some patterns I can’t seem to fit in anywhere else, so I decided to take the elements I liked the most to create something new. Something that causes people to stop and inspect. What is wrong with that? Why would you draw something like that? Why not? Who determines what is art if not the artist? Why wouldn’t an artist desire to bring something new, something unexpected into the world? I drew this, not knowing it would be drawn. I put my pen down on the paper and started drawing, not stopping until I felt the piece was complete. What inspired that? As I stated above, I look at zentangle patterns daily. Some patterns I love and incorporate into my art, while others seem to not pull me in the right direction. It isn’t the full tangle that I liked, but different elements that helped Auque take shape. I am proud of this. It is mine. And it’s okay if you don’t “get it,” because I do. So, look at it, really look at it. Appreciate the effort and detail that went into making it. That is all I ever want from my audience. Stay crafty and stay awesome!